Young Hacks Academy was an exciting day camp for 10-12 year-olds to explore programming basics and create interactive stories. 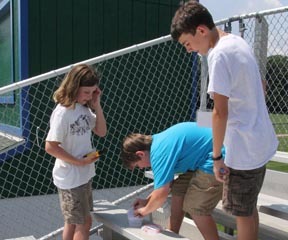 Young Hacks Agents developed collaborative problem-solving skills through daily missions in front of and away from a computer. By weeks end, graduates of Young Hacks Agent Training had sharpened their powers of creativity and communication, while making some new friends along the way. As teams of three, students walked around Colchester High School in search of 6 Young Hacks Academy “geocache” containers. Inside each container was a riddle that related to the location of the next container on the list of waypoints. 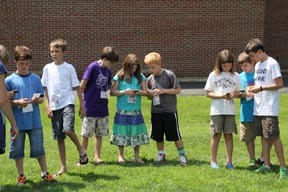 The kids had a blast using their tracking devices as a compass. As a User, I want “authoritative” datasets to be discoverable and clearly identified. As a User, I want access to aerial photos (eg: VT orthos) with no downloading required (ie: as a web service). As a User, I want a robust and easy-to-use search engine to help me find the geospatial data, web services, and web/mobile/desktop applications. As a User, I want access to historical aerial photos. As a User, I want a browser-based Data Warehouse solution that does not require a browser plug-in. As a User, I want to download aerial photos (eg: VT orthos) so I can use them on my computer. As a User, I want access to VT GIS data layers with no downloading required (ie: as a web service). As a User, I want to download VT GIS data layers in ESRI shapefile format. As a User, I want access to imagery organized by year (whether for download or web service). As a User, I want all data that I find to be available for download (not just a link to an external website). You are currently browsing the VCGI's Blog blog archives for August, 2013.